Ok, I need a chocolate recipe in here. It has been too long since I have posted anything about chocolate and my membership for chocolate anonymous (Hi Babygirl!) may be revoked lol. I had this delicious looking bar of dark Ghirardelli chocolate in my cabinet, waiting to be eaten and guests were coming to dinner. 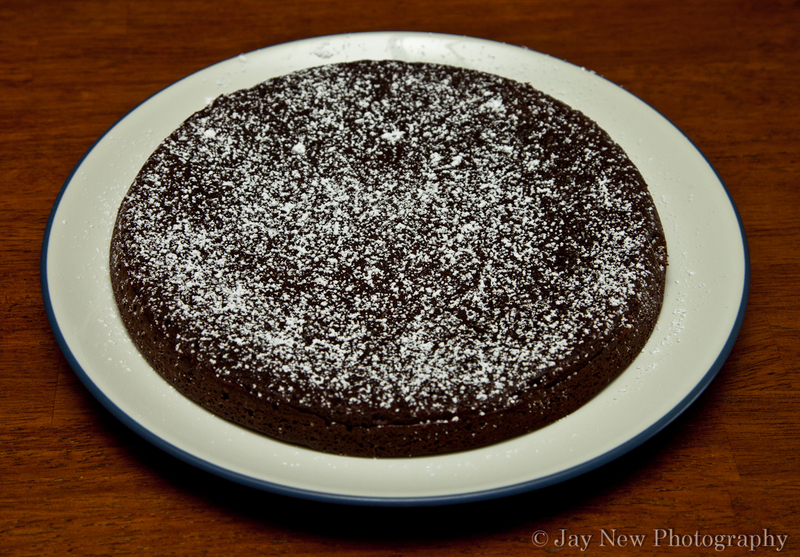 It was the perfect opportunity to make this deliciously fudgy cake. Please, use good chocolate (or the best you can get) for this recipe. You will definitely taste the difference is you do not use good quality chocolate. The best part about this recipe (aside from the chocolate) is that it refrigerates well. When I heated it the next day, it was perfect. I served this with some coffee ice cream. Cut out a circle of parchment paper, using a round baking pan (I used a springform pan) as your guide. Place circle of parchment paper inside your round baking pan and coat well with cooking spray. The cooking spray will prevent the paper from sticking to the cake later. Place dark chocolate and butter into the mixing bowl and place mixing bowl over boiling water and whisk until all the chocolate and butter is melted together. When mixture is smooth, remove from double boiler and add remaining ingredients. Mix well. Pour mixture into prepared baking pan and place pan in oven. Allow cake to cool for at least 5 minutes before inverting cake onto serving plate. Carefully peel off parchment paper. Chocolate Team UNIT! lmao. You are NOT revoked girl and you know it. You know when I saw this, I got so excited and drool begin to form LOL. I love this and you know I’m making it. I’ve made every chocolate recipe you’ve posted here. Samina you’re the best! LOL, when I was looking over the pictures of the food I had made the in last few weeks, I saw this one and immediately thought of you. You will definitely like this one. Very simple to make yet decadent. Enjoy it! Wow, this is way simpler than our flourless chocolate recipe and it looks just as good. Flourless cakes were all the rage for awhile and now you don’t see them as much anymore. I say it’s time to bring them back! I am in total agreement! Flourless Chocolate Cakes should have a definite comeback! The best part, many of my readers who are gluten sensitive, can also enjoy this as well. Makes me happy! Mmmm, I love a good flourless cake–this looks chocolatey and delicious!